As part of the extensive expansion of the Melbourne Convention & Exhibition Centre a large multi-segment motion controlled stage was built within a new 5000+ seat Plenary Hall. The stage consists of 6 independently vertically movable platform sections, with each section consisting of 3 or 5 synchronised motion axes driving Gala SpiraLifts. The stage can be set flat – level with the rear loading bay – with even fully loaded trucks able to be backed up onto the stage for easy set-up. Once set, the stage can drive to one of many selectable configurations including a stepped stage, flat floor, cabaret, and flat main stage with sunken orchestra pit. A critical factor in the implementation of the control system was the precise synchronisation of the SpiraLift axes to ensure that the platform sections stayed level and aligned with its guide rails, and that the loading across the SpiraLifts remained balanced. 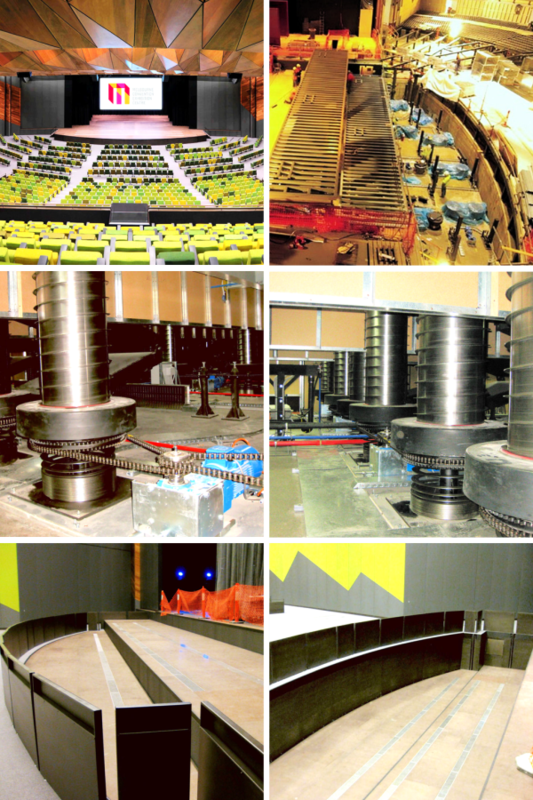 Here are some behind the scene pictures on how A&D Techeng helped this stage come to life. This is an example of A&D TechEng continuing to provide high-quality automation solutions to local industries. Contact us to find out how we can help you with your requirements.